Our mission at The Trust for Public Land is to create parks and protect land for people. But 1 in 3 people in America doesn’t have access to a close-to-home park. The Empire State Trail – announced in Governor Cuomo’s State of the State message – is a bold vision: a 750-mile trail that will connect the New York/Canadian border to New York City, providing a multi-use path that connects people to nature across the state. We are leading an effort to extend the Empire State Trail to Long Island to create a truly statewide resource and to respond to demand for a multi-use trail from New York City to Long Island. In 2018, the Trust for Public Land and New York Bicycling Coalition (NYBC) mapped out a potential east-west, multi-use trail across Long Island to provide an extension to the Empire State Trail. The study focused on utility corridors in order to provide as much of an off-road experience as possible. The trail, as outlined now, is 173 miles from Battery Park to Montauk Point. We also held meetings with Nassau and Suffolk County government officials, key business leaders, and biking and hiking clubs. Our nationwide experience in buying abandoned rail corridors and revitalizing underused infrastructure and land though imaginative planning and designs, is paired with NYBC’s network of bikers and local and government partners. We have completed our final feasibility report, and are now ready for Phase II. In the year ahead we will focus on designing and developing an implementation plan for a pilot trail segment – a 21 mile, off-road stretch that extends through both Nassau and Suffolk Counties. 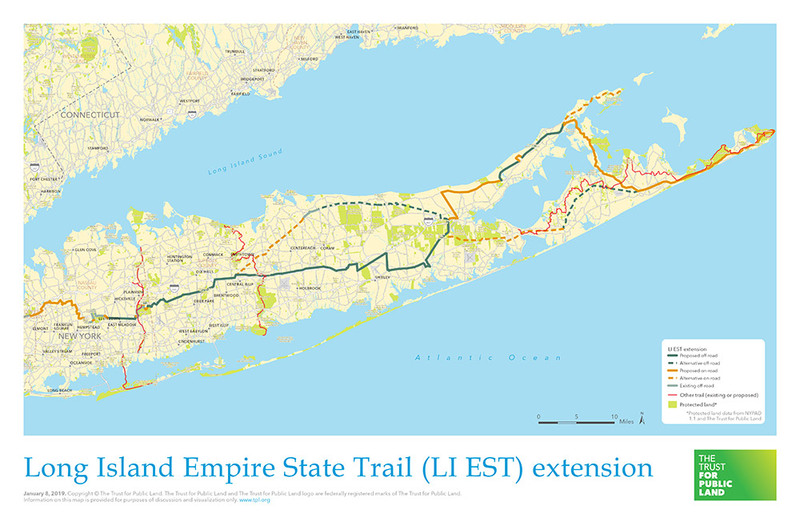 Download the map of the proposed Long Island Empire Trail Extension below. Work such as this—to bring land to people—is only possible through your support. Help us ensure everyone has access to a great park by donating today.